Every year, the HarVee Awards at Let's Talk Coffee® recognizes excellent producers and roasters in the Sustainable Harvest® supply chain. Producers are awarded in the categories of quality, consistency, and growth. Roasters are recognized for roasting excellence and their coffees are evaluated by the internationally known coffee expert Kenneth Davids of Coffee Review. The HarVee Awards serve as a chance to celebrate the exceptional Relationship Coffees that are produced by Sustainable Harvest®’s supply chain every year. 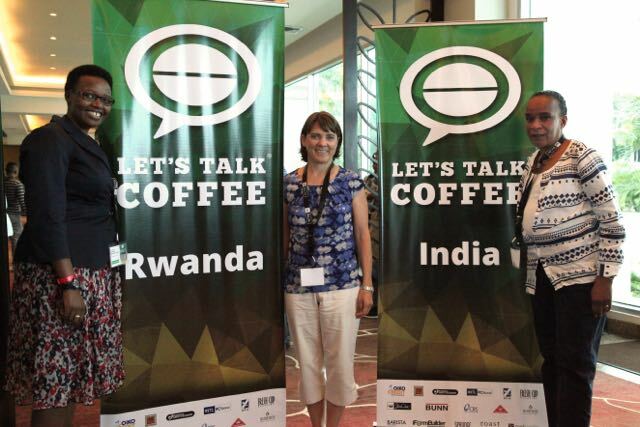 At this year's Let's Talk Coffee® event in Panama, the highly coveted producer prize for first place in the quality category was awarded to our Rwandan partner Rwashoscco. Rwaschoscco has worked diligently with Sustainable Harvest® over the years to improve the production practices of the cooperatives they represent and have now set the standard for coffee quality in Rwanda. 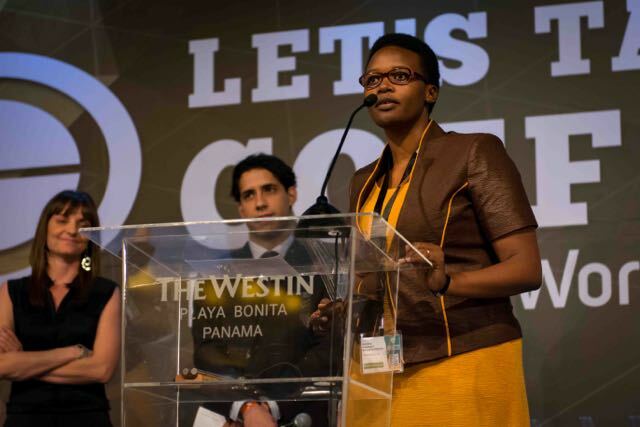 We were pleased to see Angelique Karekezi, Rwashoscco's managing director, accept the 1st place HarVee Award on behalf of her organization and serve as a role model for specialty coffee growers throughout Sustainable Harvest®'s supply chain. Rwashoscco has demonstrated that Rwandan farmers who focus on best agronomic practices and improved processing techniques at the farm level can produce award winning coffees, and connect with international buyers willing to pay a premium for a specialty product. Sustainable Harvest®'s Rwanda Project, implemented in partnership with Bloomberg Philanthropies, extends Rwashoscco's success to 3,500 low-income women farmers through training that creates the basis for improved quality and higher prices. Bloomberg Philanthropies received a special recognition HarVee Award for their support of women farmers in Rwanda. We look forward to seeing these women recognized at HarVee Award ceremonies in years to come, and hope that Rwashoscco's award for quality will inspire coffee producers across Rwanda to realize the potential of the country's specialty coffee sector.